Currently my days are filled researching communication techniques and visualization tools employed in the realm of transportation, and my work brought me to this gem of a video, an excerpt from the 1958 Disneyland TV Show, Magic Highway USA. Perhaps you’ve seen it, or perhaps this will be your first time to witness the awesomeness. Yes, the paternalistic mindset is a bit vexing but it does hail from over a half century ago. I breathe a huge sigh of relief that many of the speculative technologies and ways of transport have not become part of our urban (or rural) vernacular. (And thank goodness my day is not filled with taking Junior to the mall for “effortless window shopping on a moving walkway.”) But, I also smile and give a silent cheer in support of those who dared to speculate. Where has that gone? Why don’t we see crazy futuristic imagery like in the days of Bucky Fuller or Frank Lloyd Wright? Wright, F.L. 1958. The Living City. New York: Horizon Press. Is it that we have more access to information than ever before, making us all arm chair speculators? If access to information has increased, is there no need to employ Disney to visualize these grandiose ideas by planners, landscape architects, engineers and the like? Or perhaps our speculation has turned to different matters, like smaller technologies and communications? We’re all ears if you have some thoughts on this matter. Darn if they didn’t get some things right in this, like some safety features and increased commuter radius (code for suburbanization). Enjoy and let us know what you think. We were a little sad not to be able to see the lunar eclipse on the solstice here in the Midwest, but imagine our delight to see our very own Aurinko tea light holders arrive in time to light on the darkest night of the year. Thanks, Todd, for this wonderful addition to our home. They will be enjoyed for many years to come…. Sanna Annukka‘s latest divine creation. Perfectly timed for the winter solstice. Even if it is just minutes at a time, we celebrate the return of aurinko to our skies. Back in May of 2009, I posted about landscape architect Walter Hood, his work on LaFayette Square in Oakland, California, and musings on my own hopes for as relevant a career as his. I’m happy to share that as part of the Next Generation of Parks lecture series Walter is in our hood. The former chair of the Landscape Architecture and Environmental Planning program at the University of California, Berkeley, Hood is thought-provoking in word and deed. If this recent article is any indication of what he may describe as 21st Century Parks, we’re in for a great event. I highly recommend the article, and would venture to say the lecture is mandatory for those interested in our public realm. Lecture is at 7 p.m. tomorrow, December 2nd at the Walker Art Center Cinema. It’s free thanks to the co-presenters Minneapolis Park Foundation, College of Design, and Walker Art Center. Get there early as I suspect the cinema to fill as it did for the High Line lecture. We hope to see you there! BrainstormOverload is happy to announce Cindy’s obsession with streets and non-motorized transportation has landed her square in the middle of another blog. Thanks to Carrie Christensen and Antonio Rosell of Community Design Group for the invitation. Head on over there to Twin Cities Streets for People to check out her first post on the local impact of Congressman Jim Oberstar’s national efforts. Thank you again, Mr. Oberstar, for your service and profound impact in the realm of transportation. Bike infrastructure is becoming more and more important in cities given the resurgence of cycling as a recreational opportunity and as a viable mode of transportation to work and other destinations. That said, investments that are sub-standard and piecemeal only hurt the effort to increase a city’s bike facilities. Bike infrastructure just for the sake of having bike infrastructure is can be a costly mistake. It negatively impacts peoples perception cycling, cyclists, and of future investments. More importantly, poorly designed projects are just plain unsafe for pedestrians, cyclists, and drivers. In May of this year we reported a step forward in Saint Paul bicycle infrastructure; the very first bike boulevard in Saint Paul slated to happen on Jefferson Avenue. We were darn excited, and watched for signs of implementation all summer long. We want to stay behind the Jefferson Bike Boulevard. Really, we do. It has the potential to become a solid connection in our vastly deficient and under-connected system. But, in its watered down version and substandard design, we’re afraid we’re going to end up with a serious backlash from some residents and major safety concerns. Case in point #1: the traffic diverter and refuge at the intersection of Jefferson and Cleveland. Case in point #2: Sharrows today, noarrows tomorrow. Sharrows (share the road arrows) were part of the original bike boulevard design, but in the section from Snelling to the Mississippi Road, the sharrows were too much for the opposition and the City conceded. But, come implementation time, sharrows appeared on the road between Snelling and the Mississippi River Road (42, to be exact). We were excited for about two days, and then we saw the asphalt version of whiteout because SOMEONE suggested the City couldn’t maintain them (read: people complained). We wish we had a happy chapter two of the Jefferson Bike Boulevard, but damn if we’re not frustrated by this underwhelming turn of events. We’ve emailed public works and Councilmember Harris (that someone), and we suggest you do, too. Feel free to use this letter about the test diverter and submit it to Public Works (pw-testmedian@ci.stpaul.mn.us) and that someone (ward3@ci.stpaul.mn.us). I am one hundred percent behind your efforts to consider various modes of transportation in your projects, and I applaud the designation of Jefferson Avenue as a bike boulevard. While I support the idea of traffic calming on Jefferson and I support the idea of making it easier and safer to cross Cleveland, I’m not sure that the median is the entire answer. Please implement the diverter, but do so with other design elements such as good road striping, a change in seal-coating color, and very visible signage. I suggest you consider some of the other of the various pedestrian crossing road safety devices and configurations well-documented as successful, safe investments. 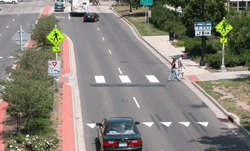 Here is a link with great ideas: thecityfix.com/zebras-puffins-pelicans-or-hawks-for-pedestrians/. A very, VERY visible intersection crossing is the only way to actually make people on foot, on bike, and in cars safer through this area. Thank you for all your efforts for Saint Paul, I hope to see the Twin Cities region become the most bikable metro area in the U.S. We need you to do better to make this happen. Author’s Note: You do not have to be from Saint Paul to voice your opinion – this is a regional issue! The Saint Paul Greenway Event was a bigger success than we could have imagined. In the weeks leading up to the event, the Committee was strategizing about how to deal with the awkward silence in the room if only a handful of people attended. Yes, we had a game plan for if we heard crickets chirping. We did not, however, have a plan for if 150 people attended and our ‘talking tables’ were dwarfed by the people gathered ’round. As the line to sign in diminished, Laura Baum of Smart Trips kicked off the conversation with a little on the Greenway Committee and its effort, Paul Nelson, Greenway Committee Chair, shared a bit about the six plus years he’s been working on this, and Russ Stark provided a dose of reality infused with touch of inspiration. The bad news: The City of Saint Paul lost the case with CP Rail which means we’ll have to reconsider how we press the City for a safe urban trail along the Ayd Mill section. The good news: 150 people rallied on a beautiful Wednesday to show their support for infrastructural investment that doesn’t play slave to the combustion engine. As Karen Hollish described in her Twin Cities Daily Planet article, the number of people who attended last Wednesday’s meeting illustrates the growing interest in and need for non-motorized transportation options. It was also apparent, through conversations about some of the design ideas, that we have to push the City to consider a safe option that accommodates multiple users at the same time. Theresa Nelson, Greenspace and Art Programs Manager of the Midtown Greenway Coalition, shared her experience and urged us to not just replicate the Midtown Greenway, but do better. She gave some fantastic insight into the process and doubly urged us to consider design elements along the corridor sooner rather than later. We’ll take that suggestion to heart (her involvement spanned eleven years and she’s still working on the effort so I’d say she’s got some credence). The resounding voice was loud and clear: Continue with the effort no matter what the speed bump. Push for the vision of a SAFE urban trail, do not settle for a measly path that is unsafe and creates conflict between users. As we suggested in our post about the High Line, visualization of a vision is essential to the process. We here at BSOL enjoyed lending a little design time to the effort to produce illustrations of what is, and what could be. We think the potential is there, how about you? Here’s the existing condition just north of the Marshall and Snelling intersection. And in the Ayd Mill Corridor, this next graphic illustrates what the consultant proposed (12 foot trail, six foot fence and no design features like stormwater gardens, lighting, benches, etc…). What about a bridge spanning the Mississippi so we really can connect to the Midtown Greenway? While this area is technically in Minneapolis, why not think about the potential? The bridge could be much, much cooler than this but here’s what we whipped up for the meeting. If the Saint Paul Greenway is something you’d like to see happen please sign on to the vision to let the City know this is a vital link to our regional system. P.S. You do not have to be from Saint Paul to sign the vision….Minneapolitans, Suburbanites, Exurbanites, the more we push for this in all areas, the better the system could be! A few months back in my post about the approved Jefferson Avenue Bike Boulevard, I promised an update. I’ve been waiting to post until I see signs of implementation so I’ll save that post until I have some real life photos. Cliffhanger, I know. Please come and join the effort of creating a world-class greenway system in Saint Paul! Download a pdf of the flyer Smart Trips produced and feel free to print and leave at your local coffee shop. Really, we’d love it.